Yellowhammer Campground has just opened for business, and we are delighted to have found it. The first night we chose a pull-through because it was late, but the next morning we chose a back-in site at the end of the row which gave us more privacy for our dogs. Our site had a concrete patio with a paver extension. There was also a grassy/sandy area where we put up our screen room. 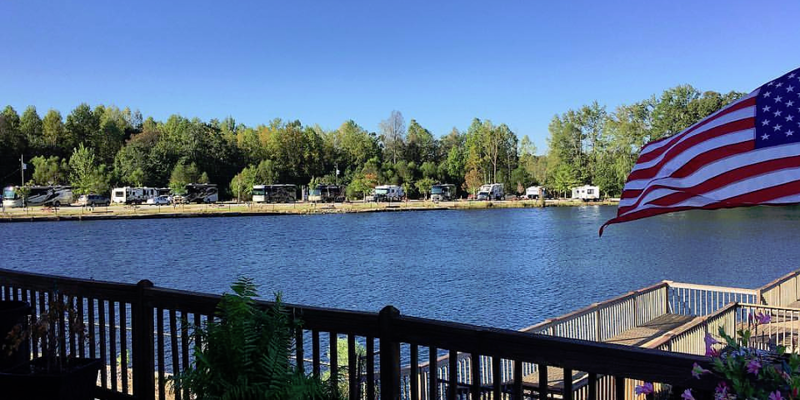 The campground has a nature trail around a small lake (catch and release fishing) and then through the associated trailer sales lot. The round trip was an enjoyable 6/10 of a mile. The restrooms and showers and laundry area are immaculately clean. There is a small lounge area with a big-screen tv and couch and chairs as well as a small kitchen area. The lounge can be reserved for groups who want to meet there. There is a fenced playground for small children and a fenced pet area. The campground is locally owned, and the owner and staff were all very helpful and pleasant. We will definitely stay here again.